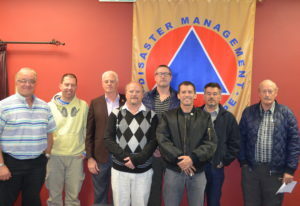 On Wednesday 29th of August the City of Cape Town’s Disaster Risk Management department had an exercise with the Koeberg Nuclear Power Station to test their disaster processes under the watchful eyes of inspectors of the National Nuclear Rugulator. HAMNET participated with the exercise and were ready to provide emergency communication backup should any of the other existing services have failed (or be simulated to fail). In matters of this scale there are multiple layers of redundancy to ensure that even should multiple simulateneous faults occur for whatever reason, the situation would never put the general public at risk. Exercises of this nature always have a planned element of surprise. The exact nature of the simulated disaster is determined by NNR on the day of the simulated disaster, and as it plays out during the day more real life curved balls are brought into the mix to simulate aspects of a disaster situation which is unexpected and tests the multiple levels and layers of all involved are tested. Various organisations are involved in these exercises, consisting of SAPS, SANDF, ESCOM, NNR, Dept of Health, Traffic Police, Law Enforcement, Arrow Bus company, etc. etc. In this particular exercise, the simulated explosion caused “damage” to an on-site nuclear waste storage facility with consequent “release” of radiation and eventual on-site power failure resulting in the disaster centre having to relocate to another (planned) site. This resulted in several backup power generators having to come on-line to provide power for control systems at the power station itself. In preparation for the exercise a mobile VHF/UHF crossband repeater was installed at a high site known to provide suitable coverage to areas where other existing systems were struggling with coverage and where coverage would be required. Three Hamnet members participated with this exercise – Dean (ZS1KP(, Hendrik (ZS1EEE) and Alister (ZS1OK). After setting up the Hamnet communications room at Goodwood for the specfiic requirements necessitated for this exercise, we were able to follow the development of the exercise from the spill-over JOC – which had CCTV coverage of the active Disaster Management Operations Centre – where the exercise was playing itself out. As could be expected there were a couple of curved balls thrown at the emergency management committee but these were all dealt with very well and in due process and time. In the end, due the the specifics of this exercise the Hamnet members earmarked to be mobile operators in support of the exercise were not deployed, but it was a good training ground to follow the process as it unfolded from the spill-over JOC. After the exercise was concluded the mobile crossband repeater was retrieved, and in preparation for future events, the radio coverage in some areas and this info is to be included into future operating procedures. Thanks again to those who participated and to Alister for arranging our response! During the gala dinner held in Pretoria in mid April, a number of Hamnet Western Cape members were awarded the Jack Twine Award. 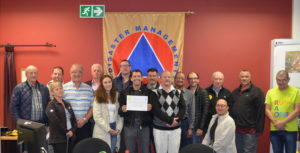 Unfortunately not all of them were able to attend the dinner.In place of a regular members meeting, HWC held an awards evening to present these to the members. The same opportunity was used to present certificates to attending members for their efforts in assisting HWC with events etc held during 2017. The certificates are a HWC initiative to recognise members for their efforts and showing them that their contributions do not go un-noticed or unappreciated. Congratulations to all recipients and thank you for your assistance through out the recent years. A group of six Hamnet operators from the Western Cape, assisted with the event communications at the Kogelberg WIldrunner which took place in rainy conditions at Kleinmond on Saturday morning, 12th of August. The six operators consisted of: Matt (ZS1MTF) and Steven (ZS1DAD) who operated from a location where having vehicles with high ground clearance was essential. John (ZS1JNT) and Douw (ZS1DGK) operated from the golf course parking area while Peter (ZS1PDE) and Alister (ZS1OK) operated the base station located in the parking area of the Kleinmond beach and lagoon. It was the first time for Steven and John were involved in a trail running event. Conditions were rather wet, with regular rain squalls during the event and this impacted the runners having to negotiate areas of large standing water in some of the trail areas. Because of the wet conditions we mostly operated from within our vehicles. Fortunately there were no serious incidents during the event and support of the comms went off well without issues. At around 08:30 a call came through for a missing hiker that was located on Platteklip Gorge. There were no operators able to respond and HAMNET WC was assisting on the Lions Journey for Sight & Service Cycle race. After checking with control Grant (ZS1GS) was released from his function to respond to the call. It appears that the patient, an Icelandic visitor, along with two friends had been hiking the previous day and separated, with the patient choosing to walk down on his own. The friends had offered to walk down with him and after a discussion they had decided to meet up at the bottom of the mountain. When the friends reached the bottom of the mountain the patient was no where to be seen. There was also a running event on the mountain and so it was believed that the patient had sought transport to visit one of the other tourist attractions. Sadly the patient was discovered deceased on Sunday morning. A team of 5 rescue personnel ascended the mountain to assess the situation. Due to the high winds Skymed was not able to fly and the cable cars were also unable to run. After the assessment of the paramedic who confirmed that the patient was deceased it was decided that the patient should be carried down the path. A similar carry out, a few years ago, took almost 30 field operators around 8 hours. On arrival Grant requested a sitrep and took over the control of Metro1. As more carriers arrived they were dispatched up the mountain to assist with the daunting task of carrying the patient down. Only around 15 carriers responded but the task went quicker than expectded. Ian (ZS1OSK) was also released from his duties at the J4SnS race and joined the operation. Ian was tasked to be positioned at the junction of the contour path and the Platteklip Gorge path so that he could dissuade hikers from using the path up the mountain. The wind was bad and along with the rescue it was not advisable for the public to be on the mountain. At around 13:35 the patient was brought to Metro1, the family where the patient had been staying and the forensic pathology vehicle gathered shortly afterwards. The patient was handed over to forensic pathology for further investigation. A debrief was held and all responding parties stood down. At 11:24 a call went out for Noordhoek Peak, with no additional information at the time as to the nature of the incident. Jason (ZS1ZW) was activated, with the initial RV indicated as East Fort on Chapman’s Peak. Upon arrival (11:55) this was amended to Silvermine parking, so final arrival there was 12:32. Between Jason and the Metro Rescue vehicle we were able to load gear and personnel for an initial team and drive them up to the peak. Updates to the call came through that there was a fallen climber in a party, at a minimum Red. We arrived at Blackburn turnoff at 12:50 and hasty team of 7 deployed at 12:54. Jason, Michael Letegan (Delta S&R) and Tim relocated up towards Eagles Nest to relay for comms into the gorge, and encountered a portion of the party who had been with the climber. They indicated that there seemed to be some confusion regarding the location, as it was NOT reported as Blackburn Gorge, but rather one over below the Eagle lookout. They were able to indicate the path to the location. We recalled the initial hasty team, although they were also returning, having made contact with a further member of the party who had advised the correct location. Brian (ZS1BTD) arrived at RV during this time, and ran control at the parking area. Additionally we had to utilise Ewart (MCSA) as a second relay for comms into the Team 1 in the gorge. Skymed became available after completing a patient transfer but they were unable to assist as the winds in the area were too string for them. The first team reached the patient who sadly declared the patient status “blue”. They requested additional climbing equipment and stretcher to remove the patient. Additional teams arrived as well as a team from forensics department. The patient was retrieved and handed to the forensics people for transportation. All teams returned to the staging area and held a debrief after which they were all stood down at 17:30. At 1745 on 16 Jan 2017, a call went out for a patient fallen approximately 10 metres at Lakeside Pinnacle near caves. Jason (ZS1ZW) was activated, and joined by Brian (ZS1BTD) a little later. Initial hope was to use Skymed, but this option was not available due to winds. On arrival (1835), Cape Medical Response controller was temporary IC, having been the one that made the call to Metro. Based on the urgency of the patient injury, and having ascertained from the locals that the walk up was not technical, he had despatched 2 of his members (ILS) along with 2 Muizenberg Fire and Rescue personnel to the patient. They reached the patient as I arrived, and gave initial assessment – Broken femur, degloving, and facial scrapes and bruises. 16 year old male, with 3 accompanying family members. Descent commenced approx. 1950, through the various belay points, and reached the road at 2043 where the CMR vehicle A2 was waiting to accept. The patient was transferred by road to Melomed Tokai. During the final stages of the descent, the road was closed by local NHW members for safety, as well as the possibility of dislodged rocks. The rescue was attended by HAMNET, MCSA, CMR, Muizenberg Fire and Rescue, Hikers Network and METRO personnel. Excluding CMR and Fire, there were 24 responders, a remarkable turnout. At around 20:10 on 13 January, a call was put out for a party of hikers that were stranded on top of Table Mountain. Due to the weather conditions the cable car had suspended operations and the hikers were stranded without lights and warm clothing. A team was sent to asses them while they slowly made their way down. Ian Stanbridge (ZS1OSK) responded to assist with communications from Metro1. The patients were reached and assessed where they were treated for hypothermia and assisted further down the mountain. The stand down was given around 22:00 after a debriefing and the patients went on their way in private transport. At around 20:30 a call came in for a 20 year old female who was overdue in the Newlands Forest area. I (Grant ZS1GS) responded for logistical support and arrived on scene at 21:00. The female and her family were visiting from Gauteng and she had spent the afternoon alone hiking in the area. She was in cellular contact with her mom and had sent her an image of her location but did not arrive back at the expected time. While a search manager was interviewing the mother of the patient, a second call for a male lost on the Houtbay side came through. This meant that the teams that had gathered were split and some sent to Houtbay while some remained at Newlands forest to search for the missing lady. The Houtbay call was on Kabonkelberg and the patient had comms via cell phone with the incident commander. He was advised to reserve the battery life for when help was closer so that he could be located easier. Phil Van Den Bossche (ZS1VCC) and Jason Codd (ZS1ZW) were deployed as logistic operators to assist with this rescue. In the meantime 5 teams of around three people each were sent through the forest to locate the missing lady. From the image that was sent to her mother it appeared that she was at the contour path 2 hours before her last contact with her mother. Further information from a trail runner showed that she was higher than expected and a team was rerouted to the area and ultimately found her shaken and injured but still able to walk herself out most of the way home but she was piggy-backed out the last stretch, which happened via Tafelberg Road. She was transported back to Newlands Forest where she was reunited with her family. At around the same time the patient on Kabonkelberg was reached and he too was in a precarious situation and required the assistance of technical rescuers to get him to safety. He was brought down from the mountain and all parties stood down around 05:00. These two incidents could have turned out with tragic consequences as the weather was becoming worse and during the night some rain was experienced. Thanks to everyone involved. At around 08:15 a call came through for a patient that had fallen 20-30 meters on Lionshead. Matt Feinstein (ZS1MTF) and Grant Southey (ZS1GS) responded as LZ operators and reported to Kloofnek. Fortunately the parking had not yet filled up and was still suitable for use as a landing zone. Matt secured the LZ with the help of SANPark Rangers. Skymed flew in and inserted a rescue technician and medic into the field before landing at Kloofnek. The technician and medic took about 20 minuted to secure the patient and treat him on a dangerous slope before calling for Skymed to extract them. The patient and medic were hoisted out and brought to the LZ where the patient was handed over to a commercial ambulance company, whilst Skymed returned to the field to collect the rescue technician. The rescue went according to plan and no notable issues arose. The patient suffered back and rib injuries but was fortunate in that he did not have a vertical fall but rather slid 20-30meters and was able to grasp at vegetation to slow the fall.